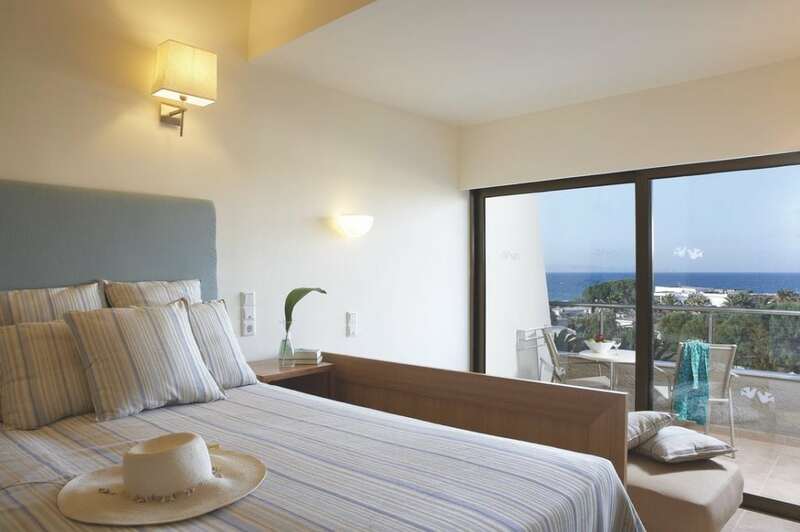 Agapi Beach Resort is located in a unique location that allows our guests to relax on the cozy beach and get acquainted with the gems of the Minoan civilization. The hotel is located near Heraklion city, and offers our guests a beautiful long sandy beach and a lush garden on its territory, making it a perfect place for a family holiday. 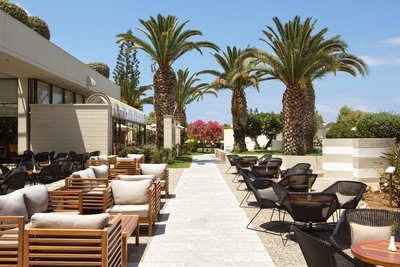 This hotel is located 12 km from the Heraklion International Airport, 6 km from the center of Heraklion city, and 72 km from the city center of Agios Nikolaos. The bus stop is in front of the hotel. Evening entertainment: Ammoudara (100 m), Heraklion city center (6 km). Sandy, wide coastal strip. The entrance to the sea is gentle. The beach is equipped with umbrellas, towels and sun loungers free of charge. A few meters from the shore, there is a natural stone ridge (breakwater). 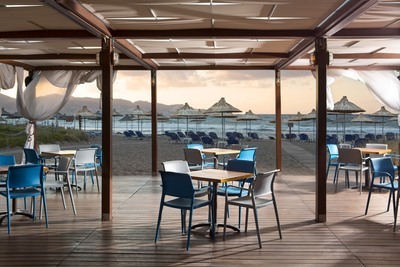 Main Restaurant: Casually sophisticated and beautifully renovated, our Crete Main Restaurant offers indoor and outdoor seating and serves buffet-style meals with a full complement of beverages. Taverna Akrogiali: Reap the health and wellness benefits of authentic Cretan cuisine at Taverna Akrogiali, our convivial Greek restaurant. Piazza d’Italia: Open for dinner, this contemporary restaurant highlights the unique flavors of Italy in a stylish, romantic al fresco ambiance. Taka-Taka Mediterranean Street Food Restaurant: Taka-Taka, our exciting new street food-style restaurant, specializes in Mediterranean favorites – from Greece’s famed gyros and delicious Cypriot halloumi to superb Egyptian, Lebanese, Turkish and Moroccan dishes. Dine in the open air. Local Taverna: It is our sincere wish that you experience the wonderful gastronomic culture of Crete and we feel that there is no better way to do so than with a visit to a local taverna. 1978 Bar: After a day spent relaxing or exploring your surroundings, you’ll look forward to unwinding at our Crete Main Bar, which offers a selection of cocktails, draft beer, soft drinks, refreshments, coffee, and tea. Pool Bar: Enjoy a drink and a bite without leaving the pool at this inviting bar, which serves cocktails, draft beer, soft drinks, refreshments, coffee, and ice cream. Garden Theater: Open during live performances only, the Garden Theater offers a selection of international and local alcoholic drinks, cocktails, draft beer, soft drinks, and refreshments. Beach Bar: Our laid-back Beach Bar serves a selection of refreshments, international and local alcoholic drinks. 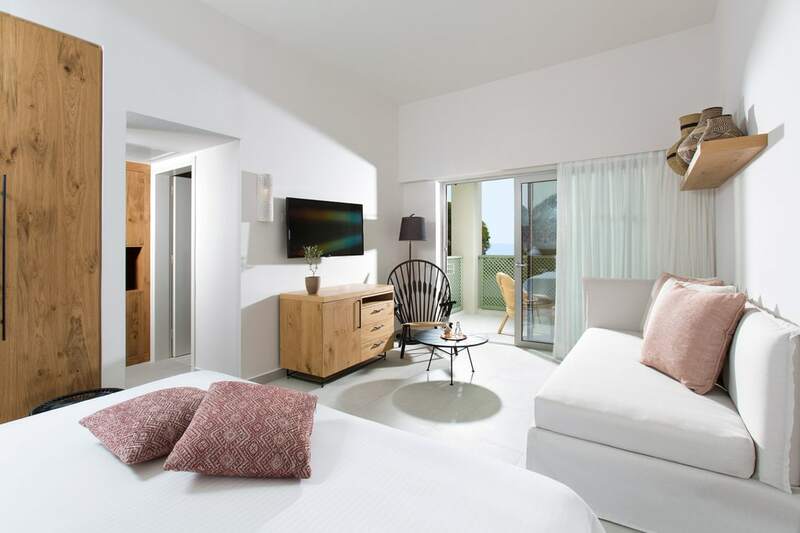 This comfortable, air-conditioned Crete accommodation features picturesque views of the resort gardens from a furnished balcony. They include twin size beds and an elegant marble bathroom with a bath or shower, as well as a flat-screen TV and complimentary Wi-Fi access. located in the main and annex buildings, main bed - 2 single beds, max 2 people, 20 m2, there is the possibility of combining rooms. Lose yourself in the stunning sea views from these 23.5-square-meter rooms, which are situated in the main building of the hotel. Each room includes twin size beds and an elegant marble bathroom with a bath or shower, as well as a flat-screen TV and complimentary Wi-Fi access. The Classic Bungalow offers views of the lush resort gardens from a private veranda or balcony. This Crete hotel accommodation includes twin size beds and an elegant marble bathroom with a walk-in shower, as well as a tiled/partial parquet floor, a flat-screen TV and complimentary Wi-Fi access. Tucked within the resort gardens, these peaceful bungalows offer close proximity to one of the hotel pools or the seafront. They include twin size beds and an elegant marble bathroom with a walk-in shower, as well as a tiled/partial parquet floor, a flat-screen TV and complimentary Wi-Fi access. These bungalows are ideal for families, with three twin beds and a balcony overlooking the sea or the resort pool or gardens. 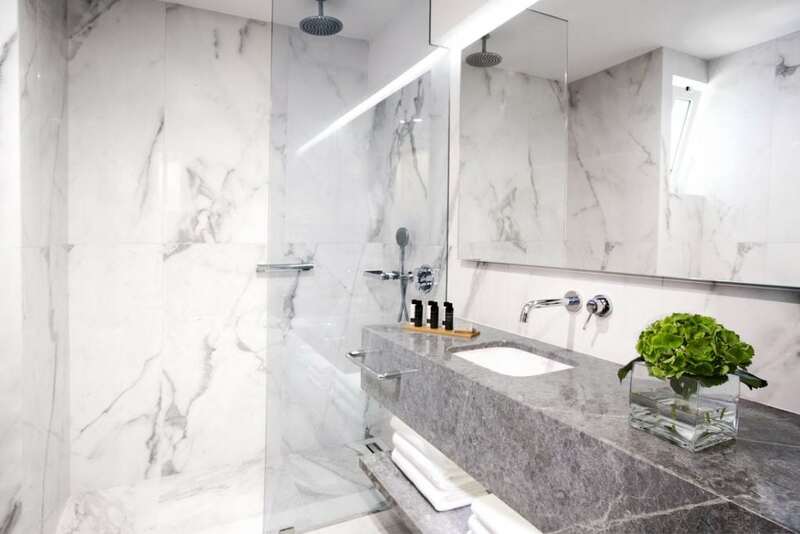 They also include an elegant marble bathroom with a walk-in shower, as well as a tiled/partial parquet floor, a flat-screen TV and complimentary Wi-Fi access. Refresh your body and spirit in these 30-square-meter accommodations, which provide direct access to one of our pools, as well as a host of other premium amenities. Each bungalow includes an elegant marble bathroom with a walk-in shower, as well as a tiled floor, a flat-screen TV and complimentary Wi-Fi access. 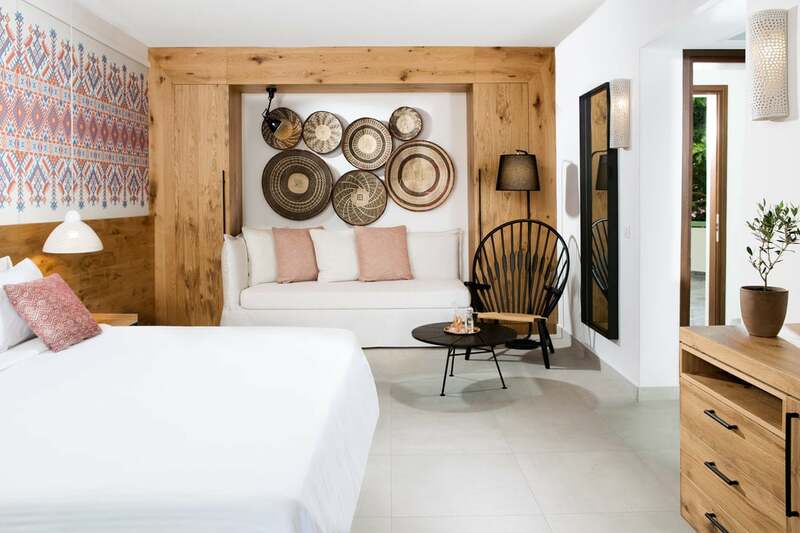 Spoil yourself with a stay in these expansive 60-square-meter accommodations, which consist of two exclusive bungalows maisonette-style with a common entrance. Each bungalow offers two twin size beds, an elegant marble bathroom with a walk-in shower, a tiled floor, a flat-screen TV and complimentary Wi-Fi access. 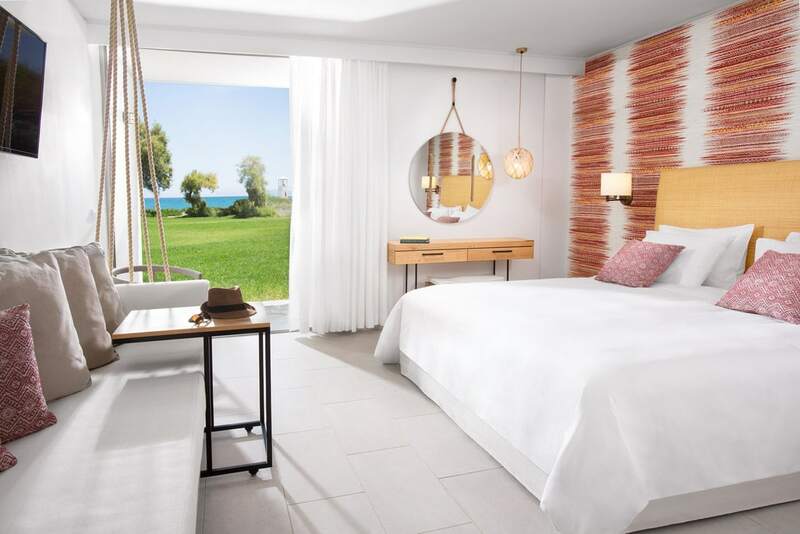 Stretch out in these stylish suites, which are completely renovated and offer elegant Mediterranean design; modern furniture and luxury touches combine to create an atmosphere that is as relaxing as it is enchanting. 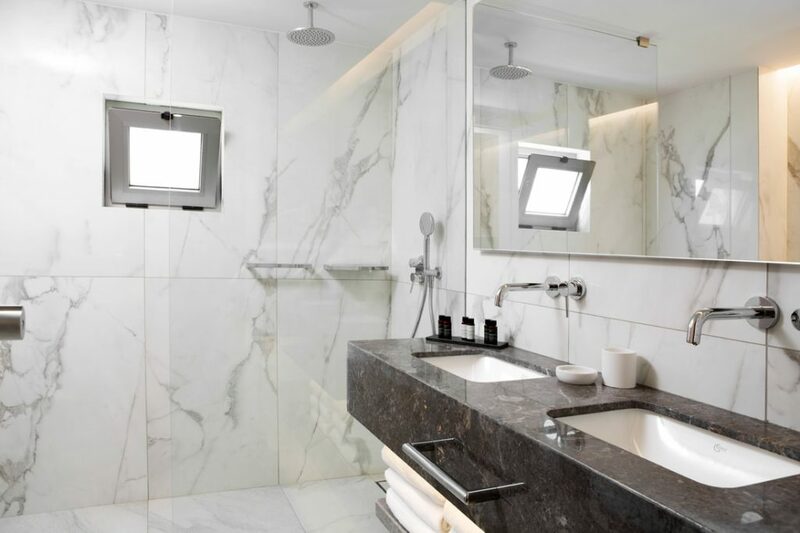 Suites include one King or two twin size beds, as well as an elegant marble bathroom with a walk-in shower, a parquet floor, two flat-screen TVs and complimentary Wi-Fi access.